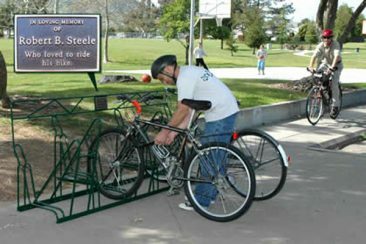 We are proud of the innovative program that allows cities, schools, universities, and churches to upgrade, or add new bicycle parking at little or no cost. 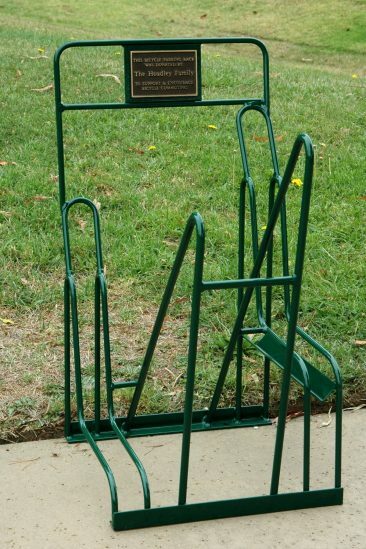 To find out more, check out our informational video Racks with Plaques Video. 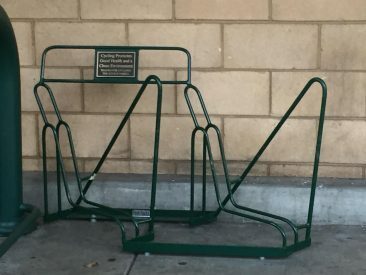 See how the City of San Luis Obispo gets FREE BIKE PARKING RACKS. 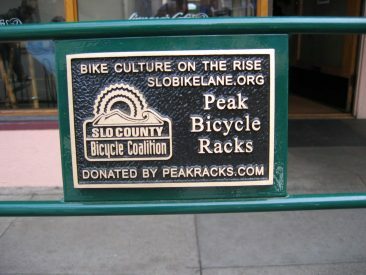 Your decision to purchase a Rack with a Plaque will benefit cyclists, the community (whether it’s a school, church, city, park, university or other organization), as well as the environment. It can serve as a lasting memorial to a very special person or group. 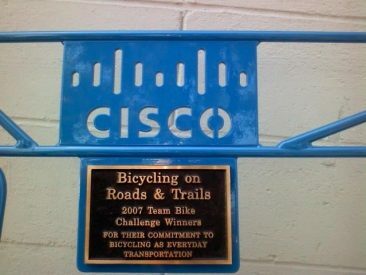 Purchasing this Rack with a Plaque is a win-win proposition! To become a donor, contact us for a list of current needs and our staff can assist you through the process. 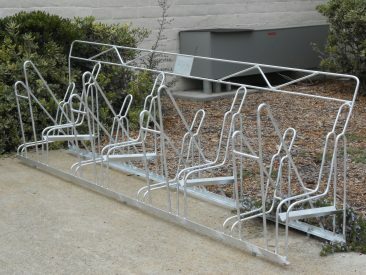 If you are aware of an area or location that needs a bicycle parking rack let us know. 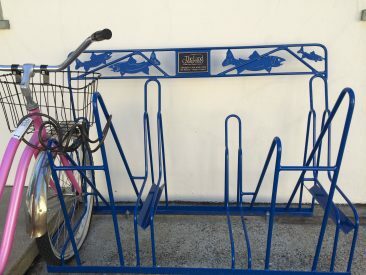 If your organization needs bike rack(s) contact us and find out if you are eligible to get involved with our “Racks with Plaques” program. 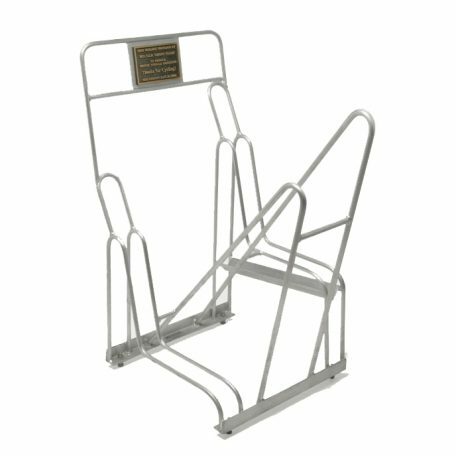 The Racks with Plaques patented design features a permanent, finely-crafted and durable dedication plaque made of cast bronze, measuring 6″ x 4″. It is made to order with a personalized message from the donor. 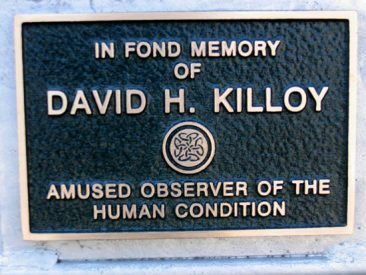 The structure that holds that plaque also serves as a convenient, code-height hand rail that allows for resting and support. 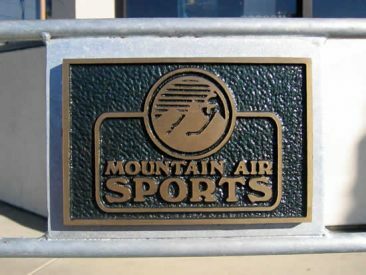 Recognition: The Racks with Plaques’ personalized dedication is an excellent way to recognize citizens, organizations or businesses in your community. 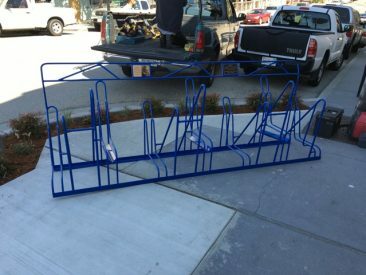 Donations: Cities, parks, schools or businesses can have racks donated to them, this offsetting part or all of the cost of the racks. 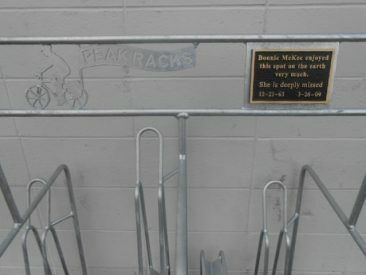 Advertising: Businesses and organizations may consider purchasing a rack with a plaque as a low-cost form of advertising.